The best source of nutrients will come from food that has been correctly chosen. A standard response of health givers is that a person consuming at least five portions of vegetables and fruits every day will get all the necessary nutrition to maintain good health. Lifestyles, however, can come in the way of such guidelines and prevent a person from eating healthy. This is the time when they need to look at dietary supplements in order to ensure that the body gets the proper nutrition that is necessary for good health. Eating a balanced diet can quite often completely give you the required nutrition, and thus allow you to avoid any additions. Such people who do eat healthy, are quite often those that do not need such supplements. But, because they are concerned with health and aware of such additions to diets, they are likely to approach medical practitioners for prescriptions for such supplements. Dietary supplements fall into the category of health products and are taken mainly to ensure that a body gets its minimum requirement of vitamins and minerals. They will have hormone-like compounds, enzymes, extracts from glands, herbs, amino acids, minerals and all important vitamins. These health products come in the form of extracts, liquids, powders, gels, pills or the most common capsules. They help you to live a healthy life and bring in a lot of benefits. The dosage needs to be the correct one, that is completely absorbed by the body, so that the required nutrition is available to the body. They do help to improve appearance, reduce chronic illnesses, stabilize moods and make the immune system stronger. There are others that can help to reduce weight, while still maintaining good health and energy levels. The best dietary supplements are the once that are based on natural sources like fresh herbs, berries, stems of plants, buds, flowers, seeds, leaves and roots. Garlic, Ginkgo Biloba, Royal Jelly, Saccharomyces Boulardii, Clove Oil, Cold Pressed Castor Oil, Epsom salt, and Ginseng are prime examples of such natural products, that have seen their extended use over the centuries, and through many civilizations and cultures. Before you go in for a regime that includes nutritional supplements ensure that you have a complete physical and medical checkup. This will help you to avoid taking any supplements that can have adverse effects or precipitate allergies. If you are buying products over the counter, make sure that you buy brands that are reputed and made by companies that have been in the business for a long time. Check the ingredients listed on the package, and make sure that are no chemicals or other products that can produce allergies. Take dosages that are safe and never more than what is suggested. 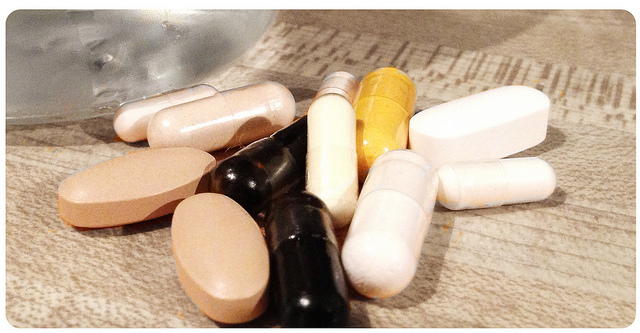 Some of these supplements can have adverse reactions if taken in large quantities. This is a danger quite often with diet pills, as people may feel that a larger quantity may give quicker results. A few of the most common supplements include vitamins and minerals and will normally have Vitamin A, Omega 3 Fish Oil, Coenzyme Q10, calcium, magnesium, zinc and iron. Vitamin A helps bone growth and can help eyesight and skin problems. Dosage of this vitamin should never be exceeded. Calcium is helpful for the bones, but over dosage can lead to some forms of cancer. Iron reduces anemia and makes for better circulation and blood systems. Magnesium supplement relief stress and boost your immune system. Good supplements are those that dissolve within three quarters of an hour after they are taken, so that they reach the blood stream. Whole food supplements are said to be the best form of dietary supplements. They come closest to giving the same benefits as that which comes from a properly balanced diet.